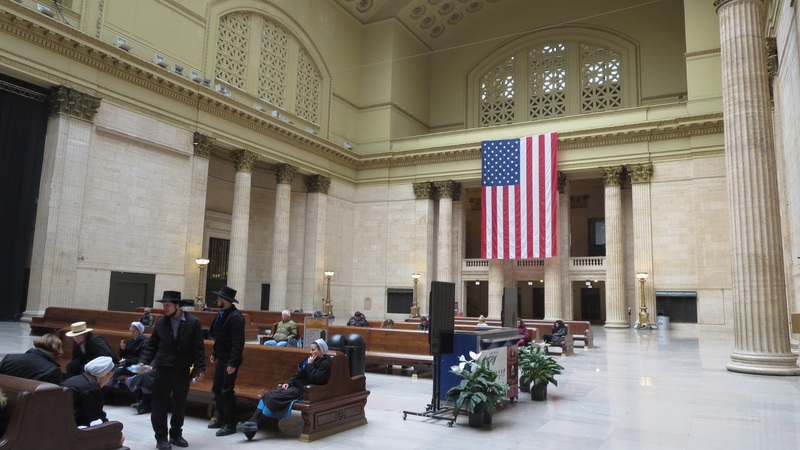 A train geek setting foot into Chicago’s Union Station is like a budding musician setting foot into Carnegie Hall. 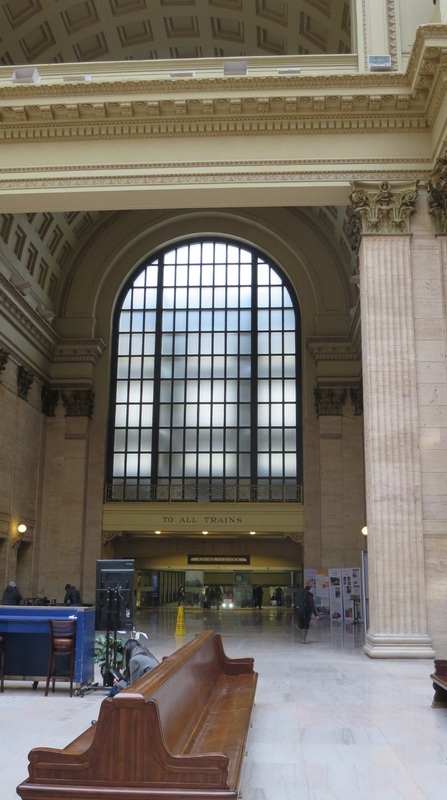 Now this was a train station! I could have spent hours wandering around and taking photos of the magnificent architecture. 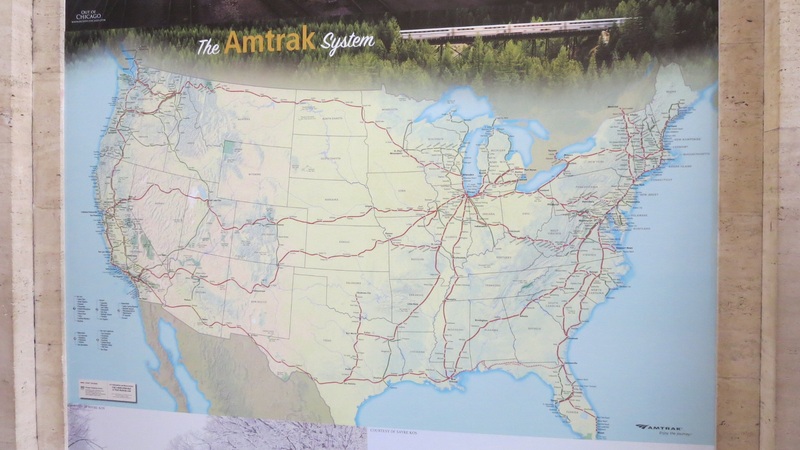 There was also a huge US map on the wall which detailed the numerous Amtrak routes throughout the country. I stood there for a while (I am also a map geek), feverishly making mental itineraries of future trips and trying not to salivate, when I noticed that I was not alone. A woman stood next to me, staring at the map and lost in her own internal geekout. So I didn’t feel too bad. 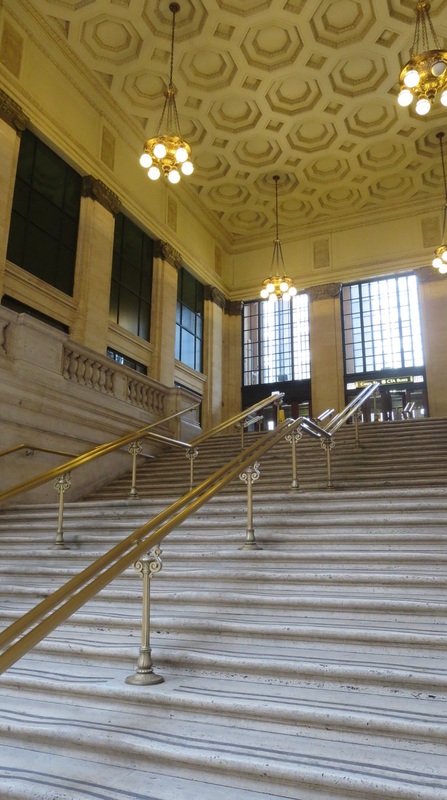 Recognize these steps from The Untouchables? I mentally created four different vacations in the ten minutes that I stood staring at this map. I stepped onto an escalator to reach the food court. I had originally planned to go to a museum on my first day in town, but since our train arrived four hours late, I decided to grab a quick lunch and just head to my cousins’ apartment. 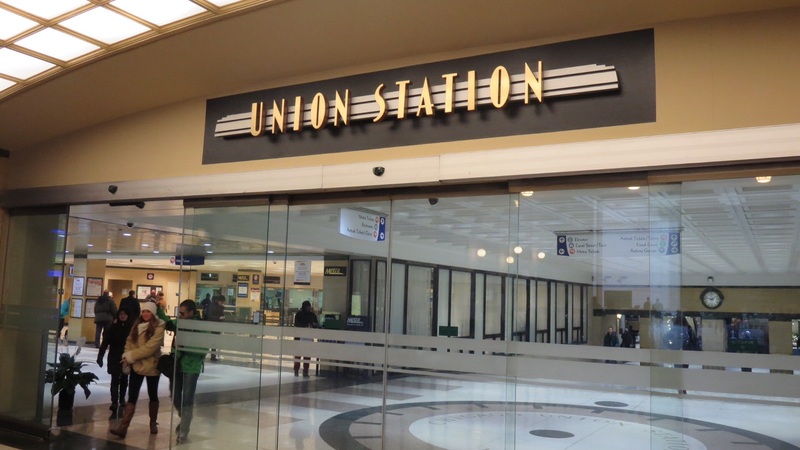 A station employee riding in front of me turned and struck up a conversation: “Are you coming or leaving?” I explained that I had just arrived and that this was my first time in town. “Ah, on the Lake Shore Limited. Welcome to Chicago!” he wished with a warm smile. I marveled at his friendliness. Toto, we’re not in Boston anymore! 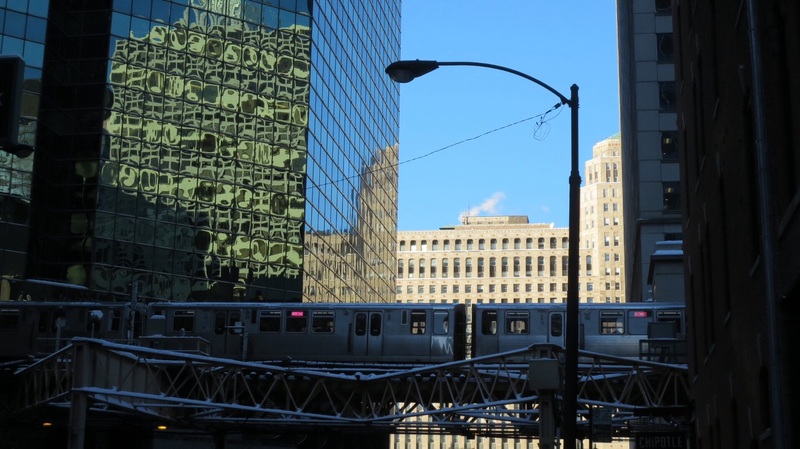 I soon had my first experience with riding the El, Chicago’s elevated train. It brought back pleasant memories of the Skytrain in Bangkok, although I don’t think Thai winter weather necessitates overhead space heaters at its stations! 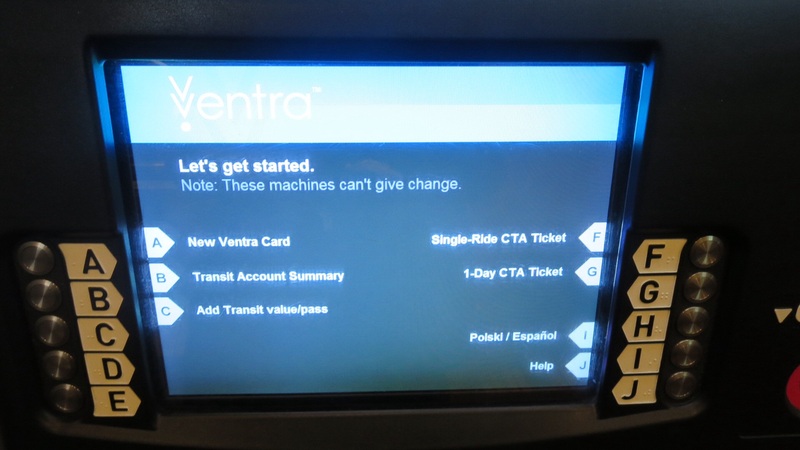 I also thought it was interesting that the Ventra card kiosks offer instructions in Polish as well as the more commonly seen Spanish option. I’ll take da 3-day tourist pass, Bob. 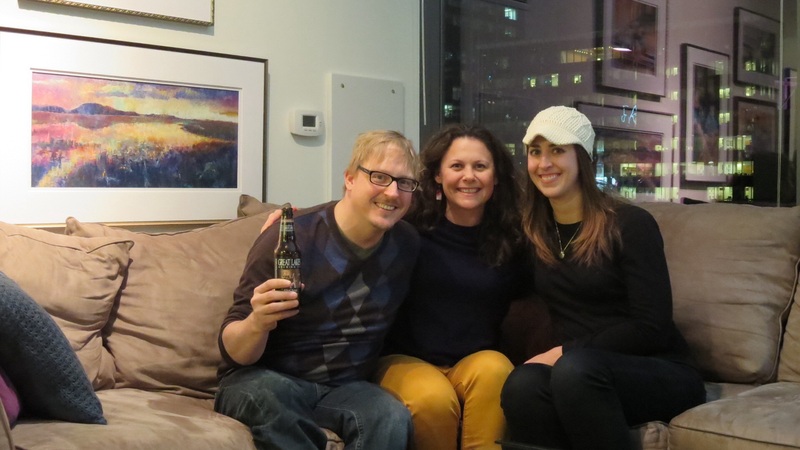 Lizza and Tricia, who are my third cousins, had generously offered to let me stay at their apartment. Once I had showered and warmed up at their place, my night of fitful sleep caught up with me, and I didn’t do much else for the rest of the evening except catch up with my cousins over some Thai food. I started off the next day slowly, finally getting in some yoga to stretch out my limbs which had been cramped into my train seat for over 24 hours. 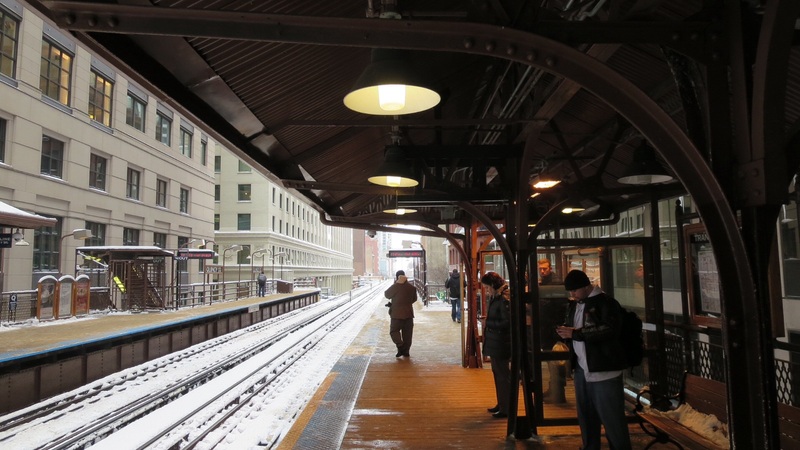 In the late morning, I set off through the slush and snow to grab a coffee at Intelligentsia coffee. I first heard of this place a few years ago at the Solid Sound music festival, where my favorite Chicago band, Wilco, brought their favorite local coffee shop up to North Adams, MA, to provide the festival’s coffee. 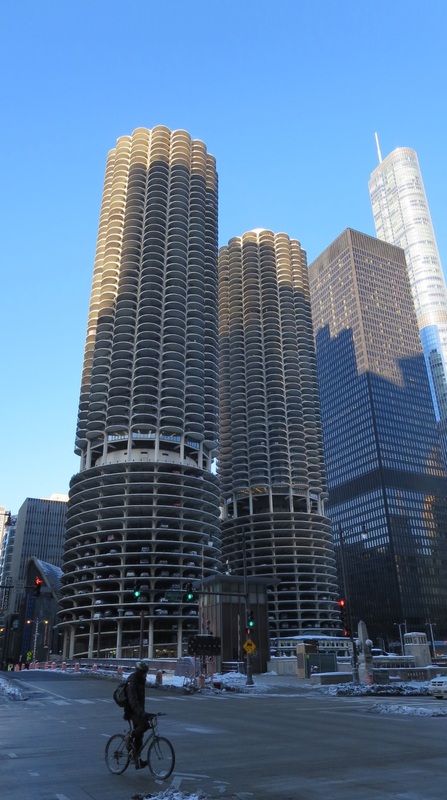 (Yay Wilco!) While my coffee was eyebrow-raisingly (I just made up that word) expensive, I sat for half an hour and enjoyed really fantastic 60’s music that sent me scrambling for my phone to Shazam almost every song that came on. 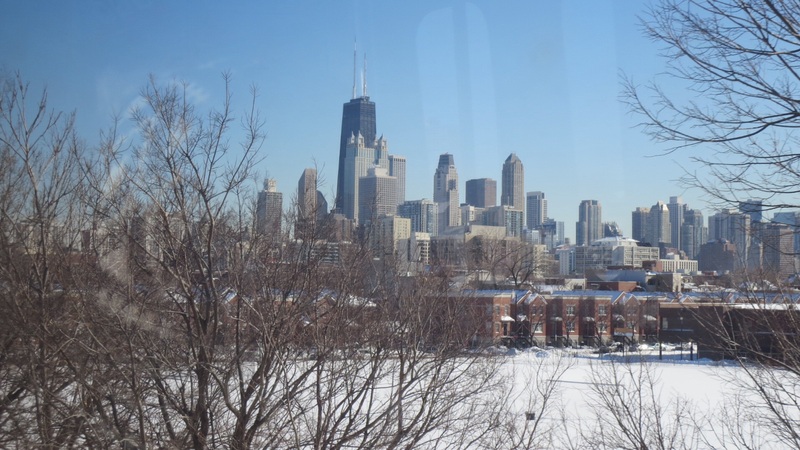 I braved the nasty snow to take the bus to the International Museum of Surgical Science. 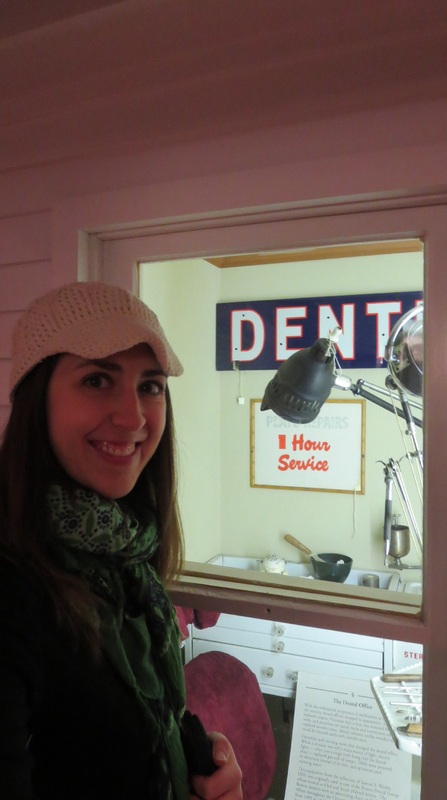 While its dental exhibit was pretty paltry, it was interesting to learn about the history of surgery and pharmacy. They even had a model apothecary inside that showed how early medicines were made. A good afternoon of nerdy fun. The downside to my visit was the bitter, bitter cold. I usually like to wander around new cities on foot, but I could only do so until I lost feeling in my fingers. Then it was time for a stop at Elly’s Pancake House for some chili. A hot, cheap meal: just the way I like it. 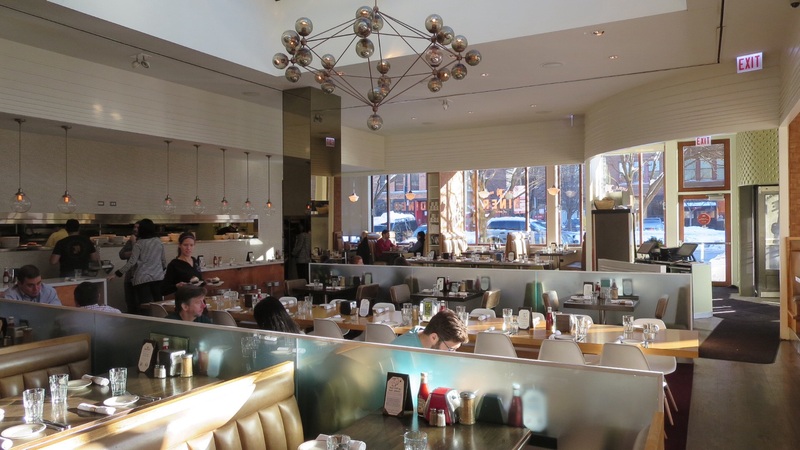 Chicago has some cute diners, no? Later on, I was invited to dinner at the apartment of Ken, my walking buddy that I met last year in Guatemala, and his girlfriend Jen. The walls were covered with Jen’s paintings, which were just as jaw-droppingly gorgeous as their view of the Chicago skyline and river. We discussed the logistics of their upcoming spring trip: completing the Camino de Santiago de Compostela by bike :). Go for it, guys! After Ken walked me to the El station, I realized that I might still have enough time to check out one of the free late-night improv comedy shows at Second City. Stepping inside the giant complex, I was struck by a wave of awe and giddiness. The walls exhibited black-and-white photos of so many famous actors and comedians that it wasn’t possible to see them all. And I did another little geekout. I have what you might call an unconditional love for Saturday Night Live and usually pepper my conversations with funny but obscure quotes and references to past movies and skits. (Those who meet me either choose to accept this or never speak to me again). 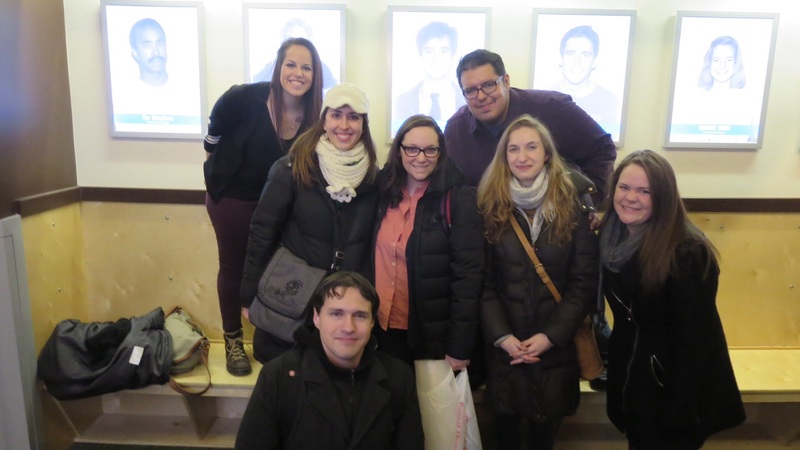 So it was a real treat to hear the improv sketches of this group of up-and-comers, who welcomed me after the show with what I now realize is universal Chicago enthusiasm. I hope that I can see some of them on SNL someday. A warm welcome from the hilarious gang at Second City, satisfying my inner comedienne. Only partly visible in the background are old photos of stars like Steve Carrell, Tim Meadows, Amy Sedaris, and others who got their start here. The next morning, the windchill was below zero, so I didn’t really relish the idea of spending much time outside. I dawdled around in the morning, working on the blog and doing anything to avoid leaving the apartment. My feet -and wallet- also didn’t feel like spending the entire day walking through a museum. So I did what I tend to do when I am unsure how to plan a vacation day: I went out to eat. I needed lunch at some point, right? Let me begin by saying that although I love to eat and try new things, I am not a foodie. I don’t want to have to wait three months to get a reservation for a trendy restaurant. Although I know that these master chefs are at the top of their craft, I have no patience for this if it means little drizzles of sauce under an expensive matchbox-sized entree with a side of flavored foam. I am entirely too hungry and cheap for that. 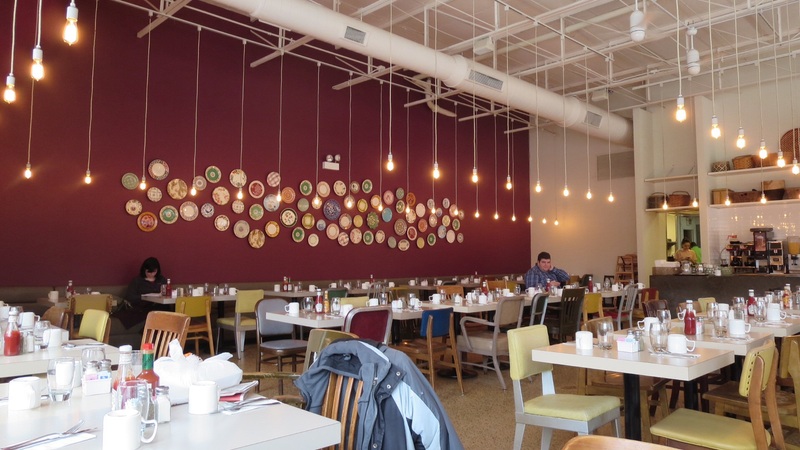 So I was excited to read that Stephanie Izard, one of the previous winners of Top Chef, had opened a diner called Little Goat across the street from her popular restaurant Girl and The Goat. A diner! That’s much more my speed. I rolled myself out of the diner and spent the rest of the sunny but freezing afternoon walking around the city and taking photos. I lasted about an hour and a half before my frozen toes cried out for mercy. 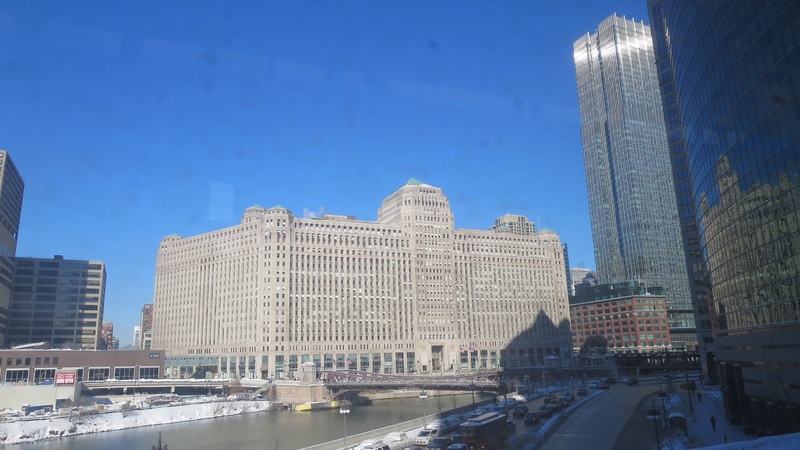 Merchandise Mart, which was once the largest building (area-wise) in the world. It has its own zip code. 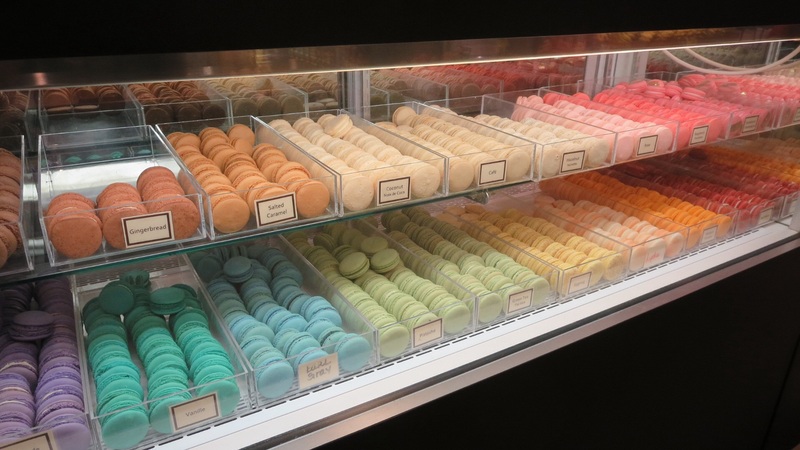 Macaroons in the French Market. Thank God I had just eaten a big lunch, or this could have gotten dangerous. I am an American aquarium drinker. I assassin down the avenue. 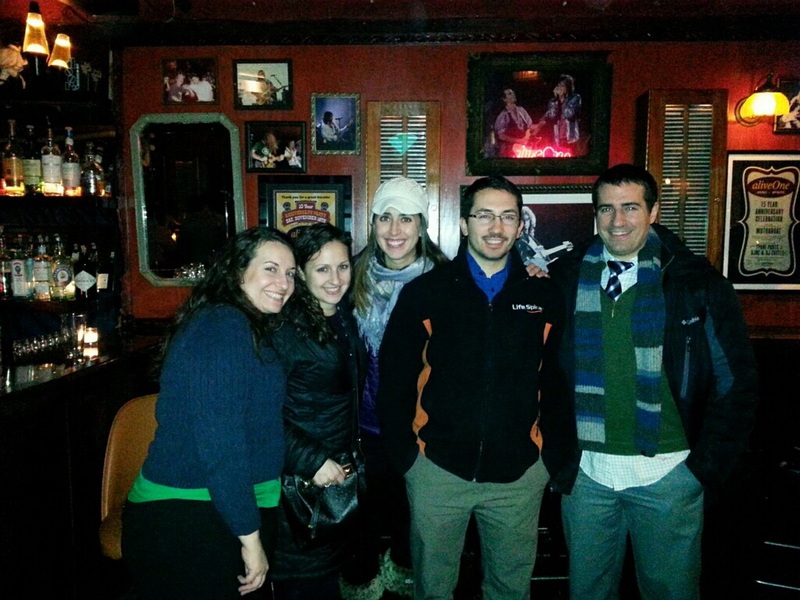 My last night in town, I met up with all the Chicago Zakelj cousins for a deep dish pizza dinner followed by a round of beers. Fun Zakelj fact: everyone in my dad’s immediate family pronounces our name “ZAY-kel” while all of my dad’s cousins and their children (including the Chicagoans) say “Zuh-KELL.” Other New York cousins have had the “j” ending legally removed. And guess what? We are ALL technically saying it wrong, since the true Slovenian pronunciation is “ZHAH-kel.” In any case, it was nice to be able to spend time with family that I so rarely see. Before my train departed the next day, I had a bit of time to kill, so along with my luggage, I played the “get off at a random stop on the El and explore” game. 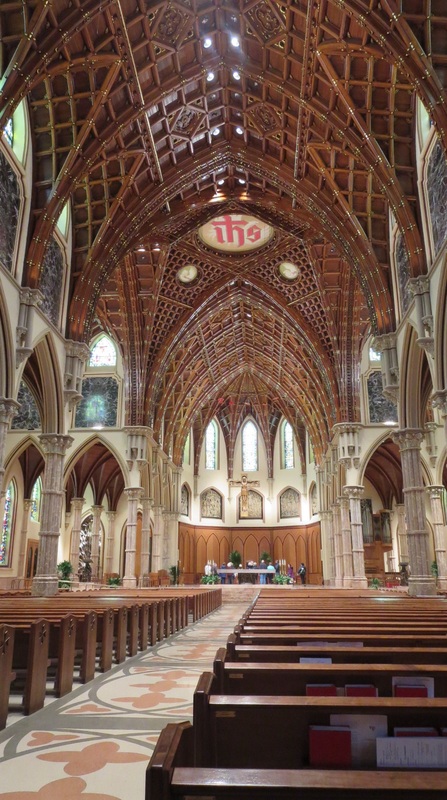 What I came across was Holy Name Cathedral, which had one of the most intricate wooden ceilings I have ever seen. LOL. I never dreamed about it, but it was a damn good meal. I was very glad that I had only eaten an apple for breakfast, because I think I might have exploded otherwise. That was some hearty food!